This Vanguard fund is tracking the investment performance of the FTSE Developed ex North America Index. With low expense fee of 0.07%, it has $53 billion of assets. This fund has a high dividend yield of 3.45%. The current share price is $41.56. In March 2015, the top 5 stocks are Nestle SA, Novartis AG, Roche Holding AG, HSBC Holdings PLC, and Toyota Motor Corp. Top 3 sectors are financial services, consumer cyclical, and industrials. Top 3 regions are Europe (61%), Pacific (38%), and Middle East (0.60%). Top 5 country diversification include Japan, United Kingdom, Switzerland, France, and Germany. The investment risks are tracking error risk, market risk, foreign market risk, etc. 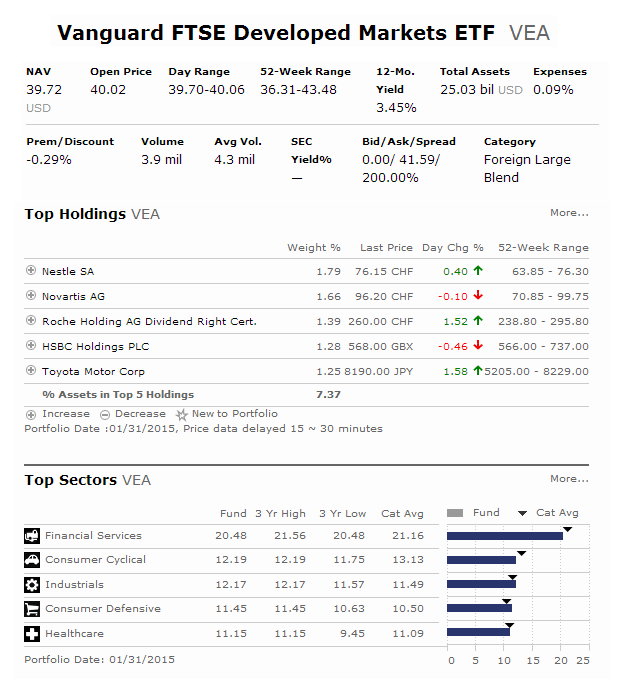 This Vanguard FTSE Developed Markets ETF has low expense fee.